Cristina Scuccia is a 25-year-old Italian from Sicily with two particularities: she has a beautiful voice and she is a nun of the order of the Ursulines. She accomplished a great success, received some criticisms and had a seemingly genuine support by participating in the Italian edition of the musical contest “The Voice”. It is difficult to say if her victory is due to her beautiful voice or her religious robe; what is undoubted, is that her success is a sign of a new way of mediating the Catholic Church and living spirituality. During the blind auditions, Sister Cristina surprised the four singers and coaches of the competition not only for her exhibition of Alicia Key’s song “No One” but also for her being a nun. “Are you a real nun?” asked indeed a very astonished Raffaella Carra’, popular singer and show-women. Sister Cristina chose to work with J-Ax – nickname of Alessandro Aleotti- a rapper who became famous in the 1990s with the band Articolo 31 and the hit “Ohi Maria”, a song promoting the legalization of marijuana. A self-proclaimed atheist covered in piercings and tattoos, J-Ax often remarked during the show how the differences between him and Sister Cristina could actually produce positive results. “I am the bro and you are the sister” he said after the blind audition “You have to work with me, because I’m the devil and you’re the holy water!”. http://www.youtube.com/watch?v=A6_0n_3hSl8 Sister Cristina’s blind audition, with English subtitles Despite the fact that “The Voice” is not a religious program, Sister Cristina enriched the show with many religious references. Before almost every performance she remarked that she had a “special protector from above” and that she was given “a gift from God she wanted to share”. In her religious attitude, Sister Cristina probably mirrored the new tendency of the Catholic Church, started with Pope Francis, of being closer to people. It is indicative of this attitude in the fact that, after the blind audition, when asked “what would the Vatican think of this?”, she answered “I would like Pope Francis to call me”. In this way, she not only remarked on the relationship the new Pope has with believers, but she also invested herself in some sort of evangelical role to be perpetrated through the gift of her voice. She did not receive a call from Francis, but she received a kind of benediction from the Catholic hierarchies when Cardinal Ravasi, one of the major figures of the Italian Catholicism, sent a tweet for her about the importance of music and quoting Casiodoro. 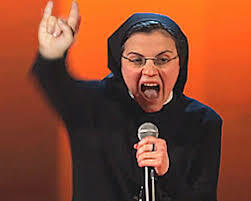 Sister Cristina’s religious attitude culminated when she won the final of “The Voice”. “I have a dream”, she said, “I want to thank who is above, I want Jesus to be here with us, I want to pray a Pater Noster”. Even if J-Ax and the other singers did not join her in the prayer and showed a slight embarrassment (J-Ax commented ironically “I might burn into fire after the Pater Noster”), she was able to complete her prayer on air during one of the most viewed shows on Italian television. The Pater Noster raised some criticisms, but overall the fact that Sister Cristina continuously made references to her faith was considered normal in the context of Italian television because of the very high amount of Catholic news the audience is exposed to, and the place that the Catholic religion occupies within the Italian culture. https://www.youtube.com/watch?v=AQHiPNIESv4 Sister Cristina praying after her victory The choice of having the rapper J-Ax as coach of Sister Cristina is probably the result of a marketing strategy. On the one hand, the differences between the two characters had certainly stimulated the curiosity of the audience. On the other hand, J-Ax’s attitude to religion is typical of a large part of the Italian population. In most of his lyrics, J-Ax ridicules different aspects of Italian society, including religion (an example is his song “Italiano medio”, “Average Italian” ), without however ever engaging in a sophisticated criticism of the system. Similarly, he explained he was raised Catholic and successively became an atheist, without nevertheless being actively anti-religious or promoting secularization. This attitude, common to many Italians, was mirrored in his relationship with Sister Cristina: in many occasions J-Ax said that he felt “spiritually enriched” by working with her, and when the nun was attacked on Twitter, J-Ax was the first to defend her religiosity. In delivering Sister Cristina the prize for winning “The Voice”, J-Ax said “ I really hope you will change things, and give an important example, and I tell you these things being an atheist”. This was an example of a non-believer who is positive toward changes in Catholicism, and that is similar to the way many atheists in Italy welcomed the election of Pope Francis and his attitude to people. The experience of Sister Cristina and this edition of “The Voice” is also indicative of other tendencies of contemporary Italian society. 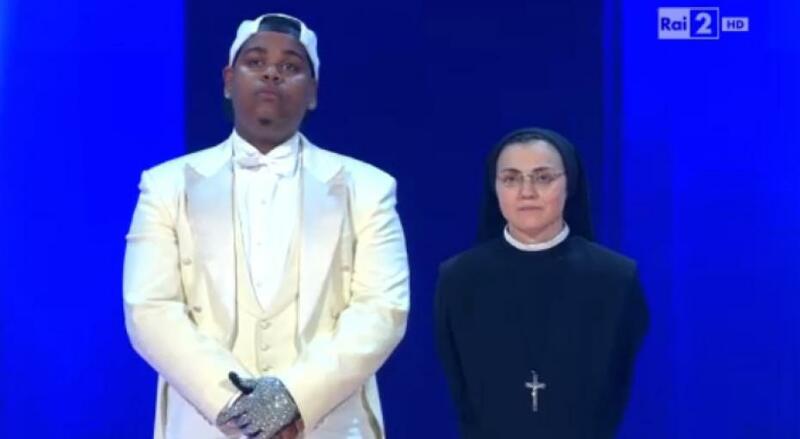 Sister Cristina had to vocally compete with Dylan Magon, a young Italian of African origin. As immigration is a recent phenomenon in Italy, it is uncommon to have a black person performing on national television, and the concept of a “black Italian” is still difficult to accept for a large part of the population. Dylan Magon insisted on this aspect of his life and sang many songs about his double identity of being black and Italian at the same time. When J-Ax had to decide who to eliminate between Sister Cristina and Dylan Magon, he struggled because both of them were very talented. “This is the Italy I wanna live in” said J-Ax. “An Italy where an African who is also Italian is hugging a 25-year-old nun, this is my Italy!” Probably unconsciously, J-Ax gave an important mediatic message: Italian society is changing and now the population is not only white anymore. However, Catholicism is still very important, as long as it is a kind of open, friendly and close-to-people Catholicism as represented by Sister Cristina. Sister Cristina surely represented a new image of Catholicism that was very welcomed by the audience that supported her, showed its appreciations by wearing t-shirts with her face even before her victory and sending tweets in her favor. It might also be that, after all the sexual scandals of the Italian political class, Sister Cristina was welcomed by the female audience as a new model of a woman who does not need to show her curves but only her talent to have success. Unless the result of the show was somehow manipulated, Sister Cristina’s victory was assured by audience support, so people must have voted for her. However, it is important to underline that she received many criticisms as well–mainly from people who claimed that she won because she was a nun and not because of her talent. This could certainly be true considering that she had already participated in the auditions of the program X-Factor before becoming a nun and was not selected. The Italian Union of Atheist and Rationalist Agnostics , for example, was among the first to notice and tweet that the song of Sister Cristina “Lungo la Riva”, commercialized on ITunes, did not have as great a number of downloads as songs by other participants of “The Voice” had. Also, she was criticized because she must consult her religious superiors before deciding whether to accept the recording contract that constitutes the prize of the show, while another participants would simply have profited from it and started music careers. However, Sister Cristina in this aspect is fundamentally different from the other participants. “The Voice”, like other reality shows and music contests, is a commercial show and its aim is to attract an audience and to sell products. Participants want to gain popularity and, in the best scenario, obtain a recording contract. In the case of But Sister Cristina explicitly wanted to pass a religious message through national TV. This is well-explained by the priest Don Mazzi on Famiglia Cristiana (Christian Family), one of the major Italian catholic magazines: “Sister Cristina used this extraordinary opportunity to bring back to people faith, music, beauty and the originality of the Christian message”. Mazzi also explained the importance of translating the Gospel in various languages and, in this case, to adapt it to the media to reach as many people as possible. 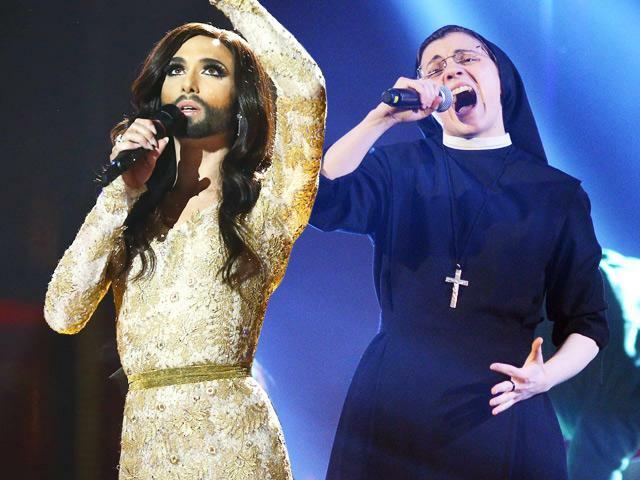 In this sense, even if the cases might seem very different, it is possible to parallel the victory of Sister Cristina at “The Voice” to the one of the drag queen Conchita Wurst at the Eurovision 2014 . Conchita had a great mediatic impact at the European music context by singing with an elegant cocktail dress, an elaborated make-up and a long black beard. The similarity with Sister Cristina’s case is that Conchita Wurst did not enter the competition only for commercial reason, but for passing a message as well. Sister Cristina’s message was religious, while Conchita’s one was about gender and sexual equality, but in both cases, music and media became vehicles to bring specific meanings to people, beyond commercial aims. Sister Cristina is surely the new voice, and the new face, of a certain type of Catholicism that is developing in Italy and in the world thanks also to the election of Pope Francis. She is not, however, the first religious person who starts a singing career. For examples, in the 1980s in Italy became very popular the Friar Giuseppe Cionfoli , while the Friar Cesare Bonizzi is famous with the nickname Fratello Metallo (Brother Metal) for using heavy metal to honor God. Sister Cristina will not probably be the last one to diffuse religious messages through Italian television, given the rising popularity of the Star Rose Academy , an art school that the nun herself attended. This academy, directed by the actress Claudia Koll, famous for her public conversion to Catholicism, forms young talents in the fields of theatre, dance and music with a special attention to holy themes and religious representations. The creator of the academy, Maximo de Marco, is also very active in evangelization through media, and he launched in June 2014 the Francisco Ensemble Channel , the first TV channel entirely dedicated to Pope Francis. It seems therefore that the mediatization of Catholicism on TV in Italy and in the world is becoming more sophisticated and that Sister Cristina is certainly one aspect of this new way of living religion. There are however many questions that probably will have no answers in the immediate future. Despite the criticisms and some ironic comments on Twitter, Sister Cristina was generally well-welcomed by the audience and certainly her religious robe helped her win the music context; would this have been the same case if Cristina had worn an Islamic veil and prayed to Allah instead of Jesus? Is Italy ready to accept not only the African-Italian singer Dylan Magon, but a new generation of non-Catholic young Italians? In an Italy where gay unions debate is still at the very beginning, would a mediatic message like Conchita Wurst’s message be welcomed like Sister Cristina’s Catholic message? What is certain is that Sister Cristina started a new mediatic discourse and she is not only a new voice of Italy, but she represents a new voice in the scenario of media and religion. The Italian sentence is “Io sono lo zio e tu la sorella” which means, literally, “I’m the uncle and you’re the sister”. “Uncle” is a slang used in the north of Italy for “dude”. “Being the devil and the holy water” (Il diavolo e l’acqua santa) is a sentence colloquially used in Italian to indicate two antithetical elements. The tweet was “Se commettiamo ingiustizia, Dio ci lascerà senza musica. (Cassiodoro)”, “If we commit unjustice, God will leave us without music”  The original text, published on “Famiglia Cristiana” on the 06/06/2014, is “Suor Cristina sfrutta questa straordinaria opportunita’ per riportare tra la gente la fede, la musica, la bellezza e l’originalita’ del messaggio Cristiano”. ← So what is this Third Space of religion in the digital age?